My great great grandfather Pleasant Bohanon Collins was a Civil War Veteran and a prisoner of war who fought as a Son of the Confederacy. There, I said it, it may not be politically correct these days; but, at one time the Sons of the South and the Sons of the Union would have reunions because they respected one another. There was an admiration between the soldiers on both sides because they knew what each had endured. Also, a tinge of regret for what happened during the ten years deemed as reconstruction which was really retaliation and retribution for President Lincoln’s asassination. Pleasant Bohannon Collins never owned a slave nor did he aspire to own slaves. He fought the war as most southerners did, not for slavery, but to end the surge of The North into the government of the southern states. At twenty-one he left the farm and joined the Confederate Army in 1861. When he was asked how many he had shot during the war, he replied that he didn’t know because ‘so many were lined up shooting and so many were lined up dying’. He never knew what his shot struck but he was known as a “sure shot ” when squirrel hunting. Fighting in the infantry in Richmond, in what was called “The Seven Day’s Fight”, the line he marched in was firing on command when hit by cannon fire. His eardrum burst. In the excitement, he was unable to hear the command to file in and was hit by a brass mini ball. When he came to, he recalled the ‘terrible thirst’ and how he wandered around disoriented for a while. He must have fallen out again when he was rolled off his blanket by a childhood friend thinking he was dead. He might have been had his fellow soldiers not needed his blanket themselves. They made a litter, a type of cot, out of the blanket and carried him to the hospital where the doctor made an incision in his back and removed the ball which had pierced the top of his lung. This hospital was captured by the Union Army. Pleasant, or PB as he was known, was transported by train to Illinois and placed in a federal hospital. He and another prisoner, with only one leg, escaped and headed south as fast as they could travel by night. He never shirked his duties as he fought in many battles before being wounded and captured. There is no disgrace in how he served his country nor is there any disgrace in fighting for freedom against tyranny whether political or religious. PB was eighty-six when he died. He outlived three wives and had ten children all together. I am one of his descendants. I am also a decendent of PB Collins. His daughter Ada Collins married Jim Norris. I am the son of their son, Lafoy Norris. I am Faron Norris. Thank you for posting this story. So wonderful to hear from a relative. I remember Aunt Ada and my Aunt Madge who is 85 speaks very fondly of both of them. They were my great aunts. I am descended from PB’s first wife and what a character he was. I have more genealogy back to the 1600’s that I would like to post. Thank you for getting in touch. Please share any family stories. Well, I see Faron found you first. I’m glad. I am James (Jim) Collins. 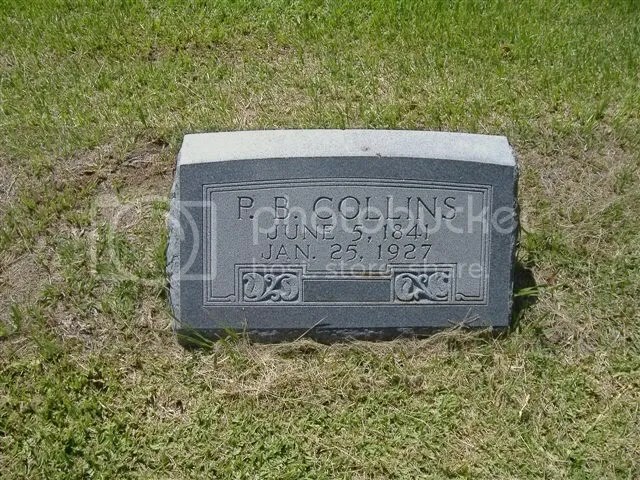 PB Collins was my great-grandfather. His son Allen B had a son named Faye J. I am FJ,s son (Fort Worth, TX). I have two sisters, Lois Ann Avery (Whitharral, TX) and Patsy Faye Christopher (Carlsbad, NM). Our great grandmother was Nancy Jane Roselle, PB’s second wife. PB Collins was an amazing man. He told my dad stories about his past because he was the only person who would listen. My dad told me the stories, which I always thought were the enhanced memories of an old man. A few years ago, I started investigating and found out that not only were the stories true, the man actually understated most of what he told and there were many stories he could have told but didn’t. I am in the process of writing a book of the stories “Bo” told dad, backed and verified by available records. I am telling the stories the same way they were received… in first person. I have had invaluable help from Lonnie Palmer (gg grandson) who had gathered PB’s muster records from during the Civil War and Carolyn Lauderdale (gg grandaughter) who has also sent valuable information and photos. I also have 5 photographs taken of PB at various stages in his life. Along with many records, some in PB’s own hand. Will share. By the way, PB always told Dad that he was wounded at Gettysburg. If he was, he may have “self-treated”, it is not reflected in the records. (He was sent to Chimborazo for Pneumonia and returned to his camp in 3 days. He was known to turn away treatment.) Self-treatment would be consistent with his behavior. Muster rolls say that he was wounded with the brass miniball in the right shoulder during the battle of Chickamauga. One of his best friends from childhood, John Boatner was the soldier who had lost a leg at Chickamauga. If you trace the activities of the Third Arkansas Infantry, Company C, you find that your forebear was in the heat of battle in a lot of the most deadly conflicts. He fought on the “Bloody Lane” at Antietam, The “Devil’s Den” and “Little Roundtop” at Gettysburg, among many others. It was at the Devil’s Den where Union Artilary was shooting down at Company C, which was trying to capture the cannon. It’s a pretty famous story in which Union fire began coming from the side and rear and all the surrounded soldiers of Company C could not hear, being temporarily by the cannon fire. Unable to get his troops to hear his commands, Col. Vannoy Manning ran to his troops and one-by-one turned them to face the new threat. Bo told that story, and it’s corroborated in contemporary accounts. The Arkansas Third Infantry Regiment, Co. C started the war as rejects, misfits and country boys who needed to “learn to be real soldiers”. At the end of the war, the Arkansas Third, Co. C had been made Robert E. Lee’s Vanguard (I hope that’s the right word) unit. They were with him at his surrender at Appomattox. I have 16 chapters written. The book will be probably 25 chapters. By the way, prior to enlisting in the Arkansas Third, PB rode for the Pony Express. The man was just a common farm boy from southeast Arkansas who had a knack for being in places where legends were being formed. But he was never more than a private in the army. The Civil War, though important, was by no means the whole story of this man. There were many other stories of other times that need telling. I think I have found records from Rock Island Prison that show the exact date and method of Bo’s escape with John Boatner. There were only 41 escapes out of 10,000 POWs. It was quite a feat for a one-legged man and a man whose right shoulder had been shattered a few weeks earlier. I need some clarification if I might be so bold as to ask. I have an obit that states that PB Collins was buried in Palicios, Texas and another that lists his burial place as Lampasas, Texas. Can anyone shed some light on this? Oh, there’s one other thing. Yes, it IS true that PB Collins fathered 10 children, but each of the women he married was a widow with children. The best I can tell, PB raised 17 children. We have a lot more cousins than we know about. One of the photos i have shows PB and “the widow McCall” (Frances, first wife) with their 6 children. I am sure glad I found you. Let’s keep in touch. Extremely excited to hear from you. My quest has been twofold, trying to find out what happened between England and Ireland and why was the name Bohannon carried so many generations later. In the process I have discovered amazing connections. I remember my great Aunt Ada, but was too young to ask questions. I am the granddaughter of AB Collins, son of Fielden, son of PB. I would love to speak with you. My number is two eight one. Eight eight three two six five one. (Spyware..spam..prevention ). What a find you are for me. I’m thinking it’s a God thing. First of all, I have a photo of Ada and Ida, along with PB and Elizabeth. Yes, that Bohannon name has spanned many generations… along with the Pleasant name. PB’s father was Felix Bohannon Collins. His original home was Limerick County Ireland. I do not know anything about years before Limerick County. The family packed up and used their last money to move to America to escape the Great Irish Potato Famine and seek opportunity in the new land. I’m not real sure right now, but Felix was either very young when they moved, or was born very soon after they arrived. I think their original American home was in Virginia. I think they migrated to Kentucky and then to Alabama. I believe the Virginia and Kentucky years were few. Felix grew up in Alabama. It was there that he met Jane Duke. Jane was, by all accounts very young and beautiful. She died of dysentery, I think, within a few months of their marriage. She was 18. Felix couldn’t stay in Alabama because of the memories and decided to move west, settling in Drew County, Arkansas. In Monticello, he became acquainted with Elijah Ferguson, a leading citizen of Drew county by virtue of the fact that he was part of an early pioneer family and a merchant (General Store) in Monticello. He was also one of the major landowners of the area. Felix got a job farming one of Mr. Ferguson’s farms and on his trips into Monticello for provision, came to know Elizas… Ferguson. I think it took about three years, but Felix married Elizas and became part of the Ferguson clan. The name Collins is well-represented on schools and streets and such in Monticello, to this day. According to records I have, (Handwritten by either PB or one of his family members). Felix died about a year after Pleasant was born. There were older children… three, I think. After Felix died, the Collins children were split up between members of the Ferguson clan and rarely got to see each other. Pleasant stayed with his mother and a youngish uncle, Thomas Ferguson. Elizas was in poor health. Within a couple of years, Thomas married a woman named Mary (I need to find her last name.) Soon after the wedding, Elizas died of disease and left Pleasant with Thomas and Mary. Within a very short time (maybe as little as a couple of months) Thomas was killed in a farming accident. Mary, who was no blood kin to Pleasant, took him as her own to raise and for several years did not court or marry. Pleasant “Rahannon Bohannon” referred to Mary throughout his life as his “Old Maid Aunt”. I’ve rambled again. Can you tell I’m fascinated with Pleasant’s story? I am sorry. The little boy’s early life was punctuated with death and loss. I’ll have to do a fact check, but I believe he had lost two siblings by the time he was orphaned. I think living with Mary was the best thing that could have happened to him. What would be the best times to call you? I am Ada’s Great Granddaughter (her son Gwyn was my granddad.) I am not in touch with very many from that side of my family so this is amazing! I did hear the story of Pleasant, but that he was 14 and lied about his age when he entered the army. All of this history is so wonderful. I would love to know about Ada. I am a great great grand daughter so my history of him is limited. I am a descendant of the first of his three wives. I’m in my mid forties so our part of the family is dwindling. There is a descendant of his second wife writing a book. Please contact me at habahouse@AOL.com . Do you happen to know the McCall child’s name? I believe he was W.H. McCall (b. Nov 8, 1861) but I don’t know that those initials stand for. He was eleven when Frances died, best I can tell. Is that right? Her Collins children were 6yrs, 4 yrs and 1 yr. at her death. I also can’t find what F.H Collins initials stand for. Any ideas? W.H.’s Dad was James L. McCall, ( also in the Arkansas Third, Co. C, enlisted in 1862) who died of apoplexy at Petersburg, Evidently, James and Frances didn’t wait long after Pleasant left town in June to get married. Frances had promised to marry Pleasant when he returned from the war. Just checking in to see if you are making reunion plans? Did you get the article on Ada? Hope the new year is going well for you so far. Yes, I received the article about Ada on the 27th. What a great Christmas present! I guessed that you might have something to do with it, but didn’t know. It is an absolute goldmine for what I’m trying to do… write about relationships and time and space. Thank You! Wouldn’t a reunion be great? What place?… Gettysburg? Chicamauga? Sharpsburg? I might actually favor Monticello, AR… his boyhood home and where he lived with Frances. OR The Waco/Temple/Belton/Lampasas (TX) area (his home territory while he was married to Nancy Jane) would be centrally located. Maybe that would be good. OR The Palacios (TX) area, (where he and Elizabeth settled and where he is buried) would have us close to the gulf coast. Wouldn’t it be cool if we could actually find one of his homes? What time?… 2013 (July 4) would be the 150th anniversary of the battle of Gettysburg.(?) But that would probably be too short a time for planning, preparation and communication. Surely there’s another anniversary we could use. Now see what you’ve done? But there are a couple of problems. 1) I’m not really very good at planning events, though I’m an OK helper and would be happy to do that; and 2) I should really finish the story and get documents scanned so I can distribute them. Ooh, Ooh, wouldn’t it be cool if someone in the media picked up on the story and sponsored the trip? Just a wild and crazy thought. Reality TV at its finest! All we’d have to do is pretend to hate each other and fight. Anger sells advertising. I must be tired. I’d better sign off before I meander any more. Keep up the good work and God Bless you and yours. You are on a roll. I am all about planning. I was wondering if we could somehow reach more relatives so I am thinking or plotting as it were. I did some research on Ancestry and the info that I have printed is no longer part of the family tree so you won’t be able to access it yourself. I would like to arrange to get that to you and to receive a copy of the Psalm that was handwritten by Pleasant. Curiosity is getting the better of me and I want to know if the slant of his penmanship will tell if he is left handed or not. The article about Ada gave me mixed feelings. I was hoping for a more warm and friendly feeling from her own words, but found them to be tough and matter of fact which doesn’t surprise me. I was raised on tough and matter of fact. I guess it comes from having survived many trials and hardships. Her granddaughter is warm, friendly and open to a reunion herself. It seems everyone is so busy these days. We have to make this a priority or it will never happen. I concur, the book and information would be a binding factor for everyone. If I can help with the editing please let me know. If you would like a quiet place to write or someone to mull things over with give me a call. First of all, you don’t get that title all to yourself… understood? At least you had hair. Our family is pretty much cue balls until they’re five or six. I for one think the pic is adorable. I’d rather call you the “Little Red-Haired Girl” (apologies to Charles Shultz). As for the “Blisster”… you really don’t forget a lot, do you? I’ll have to be more careful. Ada wanting to set the record straight… she was adamant that she was not born IN the wagon… they pitched a tent and she was born BESIDE the wagon… Priceless. The tale about Ada being tired of riding in the wagon, getting out and sitting beside the road pouting… then having her brother Preston come back and carry her, soothing as he walked… That’s good stuff. I also liked the part about PB trying to scare Jim Norris away with his gun. If Jim was a large or even normal sized man, that scene had to be pretty comical… reminiscent of Granny Clampitt and Jethro. No, the stories aren’t told terribly well, but there are nuggets of gold sprinkled through them. Now to the reunion. What if we got a Facebook membership for Pleasant? As far as I know, a Facebooker doesn’t HAVE to be living. Then we spread the word to our friends who might be or know descendants? I’ve got some pics we could use for the mug shot. I started finding a lot of information (read records) just by Googling “Pleasant Bohannon Collins’… SO…what if we actually had a free web site or blog for him, post pictures, tantalizing tidbits (SEO friendly, of course) of information or quick little stories. Tie it to the Facebook page and ask people to “Like” us. We post plans for the reunion and people “Like” them. It just might work. The reason I’m not so in love with Ancestry.com is that it’s mostly just names and dates and not all of THEM are dependable. Also, if there’s a way to actually converse with someone, I didn’t find it. I must confess at this point to a new addiction. I read your blog last night… all the way back to the beginning. I couldn’t put it down. You, my friend and some degree of cousin, have quite a talent for sharing what interests people, for including truth and inspiration and for writing it all in a way that makes people want to read. So, I’ve said that to say this. I would be delighted to have you edit my Pleasant book. BUT, it’s easy to see that you have a lot of eggs in your skillet. SO you’ll have to let me know how much you can handle and still be a wife and a mom and a merchant and a blogger and a photographer and a chicken guardian and a dog’s best friend and a good neighbor and a devoted Christian and a snake chaser and a gourmet cook and a talented decorator and… well, you know what I mean. As for the visit? I have to say that’s the best offer I’ve had today. I would love to meet you. I have a new favorite Irish phrase. I’m making it my motto. You can adopt it, too, if you wish. “Dia Maith”. Look it up. I attached a little treat for you. I think it shows a righty. Let me know what you think. Gwyn was my uncle. I remember as a child the stories he told us of his army days. He and his wife Gail stopped by here to visit about 25 years ago. They were driving a van delivering goods back then. I remember his sons, Aaron and John. My brother Neal and I used to play with them when we were kids in Watsonville, California. It is nice to hear from you. If you are on facebook please send me a friends request. Ashley, It’s so good to hear from you. I was looking at a photo of Ada and Ida just today as teenagers. I also have a picture of Ada, probably around 50-55 years old. She was still beautiful. The Collins family left Ireland to escape the Great Potato Famine. They had lived in Limerick County for multiple generations. I expect that the nearest port with ships sailing to America was in London or maybe there were more ships or cheaper fares there… who knows? You and I wouldn’t like to walk that distance, but I expect they did just that… probably with a cart to carry their belongings. Pleasant Bohannon Collins’ grandmother was nee Janette Bohannon. She was married to Joseph Collins, Felix’s father. It seems plausible and likely that Janette’s maiden name was carried on out of respect for her. My Grandfather, Allen B. Collins probably was another Bohannon, but he chose to use the initial. I’m in the process of writing a novel about Pleasant. I am making it as historically accurate as I can. I have his muster rolls from the war, (thanks to Lonnie Palmer), census records and such. If you start looking at the dates and the places and combine them with the family records I have, and the stories he told my Dad, a compelling story emerges. I haven’t seen anyone else mention it, but Pleasant actually left the farm to hire on with the Pony Express when he was 18. He told it to my Dad several times. He was definitely right for the job, but Pony Express records only account for about 150 of 400 riders. He traveled home to Arkansas in spring of 1861 after the Pony Express bankrupted and in a very short time, enlisted in the new Arkansas Third Infantry, Company C “for the duration of the war” under Col. Vannoy Manning. He was right for the PE job. The timing was right. i see no reason to doubt his claim to be an expressman. I’d love to find out exactly what leg of the route he rode, but I don’t think it’s possible to know for sure. Again, It’s probable that he rode somewhere on the eastern half. The Arkansas Third, Company C was considered misfits early on, but are well-known for the number of important and fierce battles they fought. They were at Harpers Ferry, Fredericksburg, Mechanicsville, Antietam (The Bloody Lane) and several more. They were credited with keeping General Lee from being cut off from an escape route at Antietam… possibly (probably?) saving his life. They were also at Gettysburg, fighting around the Round Tops and the Devil’s Den. It was at Devil’s Den, according to records, that the company was trying to capture a Union Artillary unit from New York who were firing down on them. It was there that everyone was deafened by the cannons and Col. Manning, seeing Union troops advancing from the rear tried shouting orders to turn but finally ran down the line, physically turning soldiers to face the new threat. It’s a rather well-known story and Pleasant was there. According to the muster rolls, it was at Chickamauga that Pleasant was wounded in the right shoulder by a brass mini ball which also pierced his right lung. It is unclear, but he may have been shot by “friendly fire”. That, by itself is an interesting story. He was among the last wounded to be picked up because he appeared to be dead. Everyone at the field hospital where he ended up after the battle was captured by the Union and sent to Rock Island, IL, to the new Rock Island Prison/Hospital. It was from there that he and John Boatner (also from Monticello and who lost his right leg at Chickamauga) escaped and rode the Mississippi River south to Arkansas. There were only 41 escapes from the prison and all but two of the escapees are named in Prison records. i believe the two un-named ones had to be Pleasant and John. The prison records actually have the date of the escape, but not the names. The Arkansas Third, Company C ended the war as Gen. Lee’s premier unit. Survivors were with him at the Appomattox Courthouse. As compelling as all that is, After the war, Pleasant continued being where history/legend was happening. He was an amazing man and the book will have enough material for a mini series. I grew up thinking Pleasant’s stories were tall tales, but the records, when you can find them, have shown me that he actually was pretty modest in his telling. BTW, I found Pleasant’s obit. He is buried in Palacios, Texas, close to the gulf coast. He lived in Lampasas, Texas for several years, so I can see how people would think he is buried there. I did myself for many years. I’ll let everyone know. After that, I’m planning to scan the records and photos I have so that any family who would like them can have them. They don’t need to be sitting in anyone’s closet gathering dust, just to be tossed when one of us passes away. eight one seven two six six seven seven nine nine.